In 1923, the first BMW motorcycle was produced; in 1949, the first post-war bike appeared and demand for motorcycles was high. With the r51/3 model, BMW turned their attention to the engine. This engine remained, on the whole, unchanged until 1969, retaining the tried and tested boxer layout. It was universally accepted as being one of the best motorcycle engines ever made. This motorcycle has a single spur-gear driven camshaft which operates pushrods that run from the top of the crankshaft. The r51/3 model has no chains in the motor, and the oil pump and camshaft are gear driven. Coil ignition was abolished and a Norris magneto provided the spark. Weight is 418 pounds. Fuel consumption is about 62 mpg. 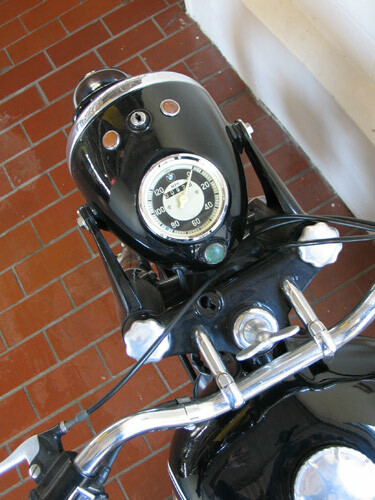 The “/3" designation behind the number refers to the 500cc low tuned motorcycles made during 1951-55.